When it comes to creating a beautiful cooking space, some decorating trends have real staying power. Case in point: The midcentury modern inspired kitchen. From colorful appliances to patterned countertops and flat front cabinetry to retro accessories, classic elements like these add warmth and personality to contemporary homes. The best part? Adding a little midcentury whimsy to your cooking space doesn't have to feel kitschy—unless that is your thing. The following ideas share how to add enduring midcentury style to your kitchen. Bold color combinations are a hallmark of the classic midcentury kitchen. In this modern cooking space featured on Harvey Maria, chartreuse green and turquoise pop against the pale cabinetry and retro, white dining set. The black and white checkerboard floor is another striking midcentury-inspired feature that enlivens the room with a playful pattern. Beautifully crafted midcentury furniture is an investment in enduring style. In this gorgeous kitchen by Modtage Design situated in San Francisco, California, a vintage teak dining table and chairs set elevates a casual breakfast nook to an elegant eating space. The floor made of contemporary cork tiles features a midcentury-inspired tile pattern. Apple green is another favorite midcentury kitchen color as shown in this fantastic example by Adam Milton out of Chicago, Illinois. The white quartz countertop is a modern feature that feels retro thanks to its speckled pattern. Vintage inspired warehouse lighting adds to the overall midcentury vibe. The kitchen range, by Big Chill, adds a little retro flair with modern conveniences. The black and white diamond floor tile is a classic pattern that dates back to the 1940s. The studio sized refrigerator (also by Big Chill) has a stamped metal body and convenient pivoting handle similar to fridges made more than 70 years ago. If you are not a fan of bold color, you should know that crisp, white midcentury-inspired kitchens are also a thing. Here is a simple and stylish for instance by Oregon based interior design firm, Sarah Phipps Design. The small space features clean lines and smooth surfaces, which are both characteristics of midcentury modern style. The flat front cabinetry is topped off with polished chrome hardware that is also in step with midcentury modern's minimalist aesthetic. The apartment sized refrigerator by SMEG has a distinctive retro vibe. The marble hexagon tile backsplash is a classic choice that brings a splash of interesting pattern. The white quartz countertop includes a drainboard sink, which was a chief feature in many authentic midcentury modern kitchens. Ceramic tile was a popular choice for countertops and backsplashes in kitchens and bathrooms in authentic midcentury homes. The trick to getting it right is pairing white or colorful tile with a black tile border as shown in this sizable retro kitchen by Jackson Design and Remodeling out of San Diego, California. Here a sunshine yellow tile countertop and backsplash are both punctuated with jet black tile. The straight lines of the shaker style cabinetry enhance the kitchen's vintage charm. A midcentury-inspired range adds both function and style. While checkerboard floors like this one were made of sheets of ultrathin linoleum in the 1950s, which wore out quickly, this one is made of durable and modular Marmoleum tiles, a type of natural linoleum flooring free of volatile organic compounds. Laminate countertops were super popular throughout the 1940s, 1950s, 1960s, and beyond. They provided home chefs with a durable work surface that was available in a broad range of colors and patterns. When Seattle, Washington based construction firm Hammer and Hand was renovating this kitchen, they selected a laminate countertop by Pionite in a particular style called Formal Mahogany. The countertop has a smooth aluminum edge, which helps to protect the laminate from scratches and dings. The midcentury-inspired checkerboard floor is made of vinyl tiles by Armstrong in contrasting shades of Maraschino and Buttercream Yellow. In our humble opinion, no midcentury modern kitchen is complete without a few must-have appliances in bright or pastel colors. Atlanta, Georgia based interior design firm Kandrac and Kole added midcentury charm to this traditional cooking space by pairing a retro red range by Big Chill with a cherry red electric mixer and bowl set by KitchenAid. Take your contemporary cooking space back in time with kitschy countertop accessories and a glass backsplash in retro pastel shades. This midcentury modern refresh by Susan Jablon Mosaics out of Binghamton, New York does just that. The set of vintage canisters are a prized flea market find. The backsplash features a mosaic layout that alternates mini subway tile with colorful square tile. Sarah Phipps Design based in Oregon gave this midcentury kitchen new life thanks to a good scrubbing, fresh paint, and a spanking new subway tile backsplash. 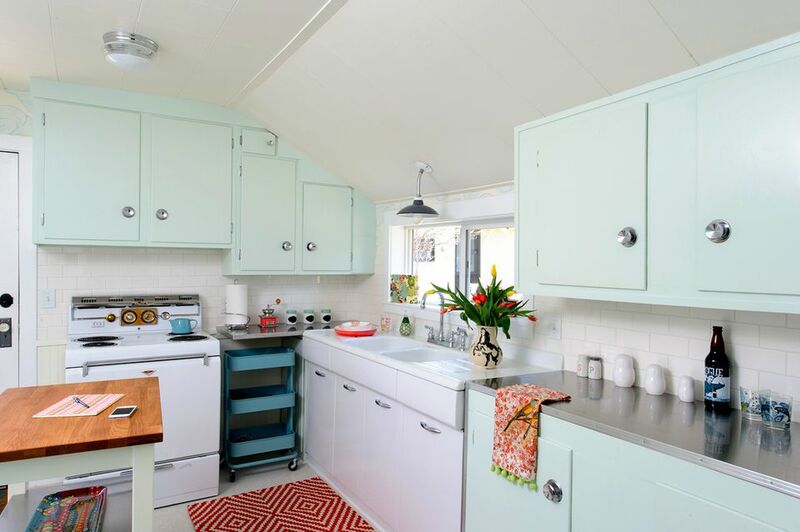 The flat front cabinetry, which is original to the home got a lick of new color in a retro shade of minty green. The retro cabinets knobs in polished chrome are from Rejuvenation. The Formica countertop, a midcentury staple, has a sturdy aluminum edge that prevents chipping and scratching. The vintage white base cabinets are powder coated metal. Our favorite piece in this cooking space is the classic farmhouse drainboard sinks made of porcelain. Above is a vintage task light. Meghan Meyer, the occasional blogger behind Metaphors Mixed, calls her white and blue cooking space the boomerang kitchen. The room features a funky laminate countertop in a retro midcentury modern pattern called Glacier Boomerang by Wilsonart. Pam Kueber, the midcentury modest décor enthusiast behind Retro Renovation, created this pitch-perfect midcentury modern kitchen when renovating her 1951 colonial ranch house located in Lenox, Massachusetts. Many of the items in the kitchen are authentic to the period from the round Saarinen "tulip" dining table set to the metal turquoise cabinetry. The latter took years to find. They set finally popped up on eBay. Another eBay find in this kitchen is the pull-down light over the table. It is a piece from 1959 called the Imperialite, by Emerson-Imperial. How much did it cost? A mere $12.